It’s necessary that all people get the awareness about this serious crime, to free this modern slaves and end modern slavery – because it’s unfortunately often more close to you as you expect. By the way, how many slaves work for you? – No one, no idea? Be sure, there are working some. How many, you can find out here at slaveryfootprint.org – it’s really shocking and you would not belive. 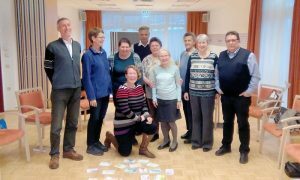 On Saturday December, 2 the groups of the Austrian Lay Salvatorians had their annual day of contemplation at the Salvatorian Sister‘s Province house in Vienna. 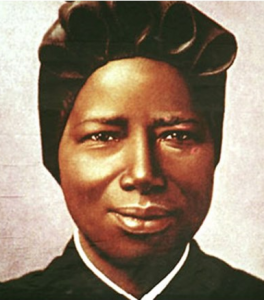 The topic of the day was guided by the Father Jordan memorial year and turned around the question: the beatification of Fr. Jordan – what are the important things in his life for me? In a small preparation at home in advance, each participant was invited to find some short lines, sentences, and keywords about his/her individual access to Fr. Jordan and the process of beatification. At the beginning session, each one had 3 minutes to present his/her thoughts. Afterwards, we filtered out the words or terms which were mentioned repeatedly and wrote them on a flipchart. With that, we went into small groups for more intensive discussion and exchange of thoughts. Some sections of “minutes of quietness and prayer” as well as common sharing the food each one brought had brought with him, made up a spiritual day for body and soul with reach deepness and manifold meetings. Thanks to the Lord for this wonderful experience. The members of the Salvatorian IJLG teams in front of the statue of our founder Fr. Francis Jordan at the motherhouse of the Society in Rome. 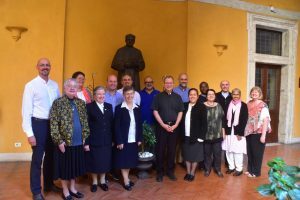 The General Committee (GC) of the ICDS and the Salvatorian International Joint Leadership Groups (IJLG) met last week in Rome/Italy. Some difficult and challenging discussions accompanied the GC team through this GC meeting. The main topics were the work on the response from and to the office of the dicastery of the laity, family, and life about the recognition of the ICDS as an association of the faithful. Furthermore the texts of the Salvatorian family proposals which will be presented at the General Chapters and the General Assembly of the three Salvatorian branches in 2018. The planning and preparation start of the General Assembly showed the quality and enthusiasm of the team so that all Lay Salvatorians can expect a motivating and spiritual high light in July 2018. The afterward following IJLG meeting was also dominated by the Salvatorian family proposals because these proposals can be seen as guidelines for the coming term of office of the new leadership teams and should strengthen and deepen the common living and cooperation. 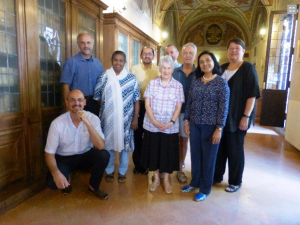 The meeting of the International Joint Charism Commission took place at the Generalate of the Society of the Divine Savior in Rome from July 10 – 15, 2017. The question of to deepen the identity as Salvatorian Family is always an important topic. Also to pray, reflect and consider various matters and to experience salvatorian collaboration is always enriching and was task of the meeting. 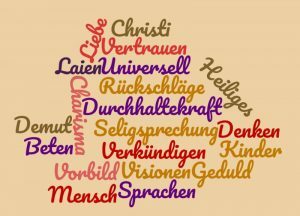 This last meeting of the commission mostly concentrates on finalizing the work already started at previous meetings: especially articles written by various members of the Salvatorian Family around the world will be published soon as an new issue of “Salvatorian Key Elements”. In this way, the contextualized and cultural points of view can be taken into account. The translations are very important and can help more members to have access and benefit.